Kwagūtl and Kwakiutl were former names for the extremely endangered British Columbian language now known primarily as Kwak’wala. This indigenous nation of about 5,000 descended from Kwak’wala speakers refer to themselves as Kwakwaka’wakw; there are about 250 speakers of this Wakashan language today in villages on northern Vancouver Island and in adjacent mainland coastal communities. Stan J. Anonby’s 1997 study of Kwak’wala and the possibilities for its revival—Reversing Language Shift: Can Kwak’wala Be Revived?—is available online in Adobe Acrobat format. Alfred James Hall (1853-1918) of the Church Missionary Society translated a substantial selection of Christian books into Kwak’wala. His version of the Acts of the Apostles (1897) is available online through GoogleBooks; Hall also published the gospels according to St. Matthew (1882); St. John (1884); St. Luke (1894); St. Mark (1900); and a Kwak’wala grammar in 1888. Hall was active in the northern Vancouver Island’s missions at Fort Rupert and Alert Bay from the late 1870s after his initial missionary work in the Tsimshian-speaking communities centered on Metlakatla, B.C. The Kwak’wala-speaking Anglican community at Kincome Inlet is the setting for Margaret Craven’s 1967 young adult novel I Heard the Owl Call My Name. William Muss-Arnolt discusses Anglican Kwak’wala missions and translations in Chapter LXX of The Book of Common Prayer among the Nations of the World. In his Bibliography of the Book of Common Prayer 1549-1999, Griffiths identifies this 1900 publication erroneously as a reprint of an earlier 1888 translation; in actuality it can be viewed as an expansion of that work. The 1888 Kwagutl Version of Portions of the Book of Common Prayer (Griffiths 83:1) included Morning Prayer, Evening Prayer, the Litany, and selected prayers and hymns; this 1900 translation is of Holy Communion, Baptism, the Catechism, Confirmation, Holy Matrimony, and the General Thanksgiving and Prayer for All Sorts and Conditions of Men. It is also available as PDF graphics from the Internet Archive. Anglican hymnals in Kwak’wala have been published in 1916, 1935, and with a new orthography in 2002. 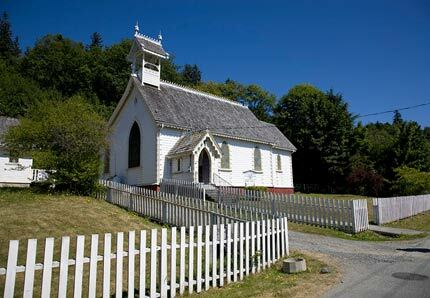 The Anglican Church at Alert Bay, where this translation was first used.